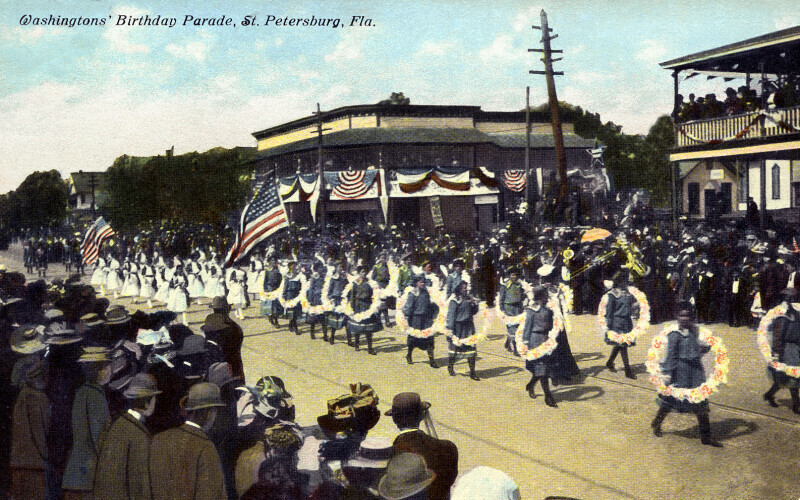 This postcard shows people marching the Washington's Birthday Parade. In the foreground, a group of gray-uniformed women are marching, with large, round flower wreaths slung over their shoulders and across their bodies. The group behind them also appears to be all female, wearing white dresses. The crowd to the left of the street watches intently. On the right side of the street, a band appears to be playing brass instruments. Also to the right, more people watch the parade from second floor balconies. The balconies are festooned with red, white, and blue bunting and streamers. WARNING: You are about to download a 5.4 MB TIFF!